We provide vital funding to small voluntary organisations who are on-the-ground helping Europe’s most vulnerable refugee men, women and children access their most basic human needs. foodKIND have gained permission from camp authorities to provide the only food to over 200 refugee men, women and children who are camped, unsupported, outside the Malakasa Refugee Camp. Our funding is providing food for three months. Refugee 4 Refugees are providing daily education, activities and a safe place to play benefiting around 250 of the youngest children living in the Moria Refugee Camp, thanks to our funding 12 months’ rent for the land. One Human Race provided a months’ essential groceries and other household needs to several vulnerable families and marginalised young male refugees in Athens, thanks to our support. Mobile Refugee Support distributed critical aid like tents and sleeping bags, along with practical help like wifi and mobile phone charging, to help up to 500 homeless male refugees in northern France throughout the cold month of February, thanks to our support. The ANKAA Project is training 40 refugee students in jewellery-making, construction and carpentry during two months, thanks to our funding the materials needed for these practical courses. Refugee Biryani and Bananas are sending a container of aid to Chios and Samos full of new socks, boxers, jogging bottoms, hoodies and t-shirts to provide much-needed clothes to over 3000 refugees, thanks to fundraising in partnership with Donate4Refugees. Project Play provided imaginative play and activity sessions to 70 refugee children across four locations in northern France thanks to our funding fuel and travel costs for the volunteers to cover the 735kms every week for a month. FORGE for Humanity are providing critical support to the often overlooked and marginalised male refugees in and around Athens. They can do this from their modest offices in the city centre thanks to our supporting their rent, bills and a simple breakfast for six months. We’re delighted to send £2,500 to the Asylum Seekers Information Services Team’ (ASsIST) on Chios to pay two full-time interpreters from within the refugee community. Their services will assist many others understand the process and prepare for the critical interview that will decide their future. Thanks to a partnership between MRS, Donate4Refugees and Get Connected this generates a little over £2,000 each month for MRS helping to cover rental of their volunteer house and critical warehouse which enables Charlie, Jed and the team to provide essential help to homeless refugees every single day. Refugee 4 Refugees are operating the only aid distribution centre for more than 2000 refugee women and children thanks to our funding the warehouse rent and bills for six months. These kids were SO happy with their new winter woollies! Thanks to a brilliant donation of £2,000 from our friends at People Not Borders, volunteers from the refugee community in Athens, Thessaloniki and Lesvos could be quickly mobilised to help urgently in Samos. This donation paid for rental, basic furnishing and heaters, for the volunteer house. We support Refugee Childrens’ Centres with a dedicated fundraising page. Most recently, your donations have enabled us to send £1,200 which will be helping to fund the School Bus Project bringing much needed education and activities to the refugee children in Dunkirk and Calais. Thanks to one of our generous supporters, two families in Athens receive extra financial help each month at a given time. We’re happy to say two such families have been able to continue into Europe to start their new lives. And two more families are receiving the much-needed help. We funded a month’s fuel for the minibus used by volunteers on Lesvos to collect and drop-off the families from Moria Refugee Camp and bring them to the warehouse “free shop” distribution centre. Here the families can choose some much-needed new clothes. We support the Phone Credits for Refugees group with a dedicated fundraising page. Each month we’re able to forward at least £1,000 of your donations to buy credit for refugees. This means vulnerable people accessing vital information and help, as well as contacting their loved ones. Together with three regional UK refugee groups we give monthly support to Mobile refugee Support (MRS) to help ‘keep the wheels turning’ on their critical services for refugees. Together we’re covering unavoidable expenses like toll roads, fuel, and van maintenance. Together with Side by Side for Refugees we give monthly support to Paris Refugee Ground Support (PRGS) to help ‘keep the wheels turning’ on their critical distributions of tents, blankets and much more, to refugees on Paris’ streets. Together covering unavoidable expenses like toll roads, fuel, and van maintenance. In December we helped volunteer Sarah and the Refugee Info Bus team take part in The Big Give Christmas Challenge by pledging £500 towards doubling donations made. This funding means they can continue their legal education, advocacy and collaborative journalism together with people displaced in Europe. We funded the rent for the Samos Volunteers’ laundry station helping 1500 people thoroughly wash their clothes. It’s considered one of the most important projects since there are no other laundry facilities despite bacteria, bed bugs, scabies and lice being prevalent in camp. We helped towards a critical food distribution to the 2000 residents of Vial Refugee Camp in Chios. Food is always one of the most wanted items in camp because the food supplied by the authorities is poor and people can’t afford to buy their own. 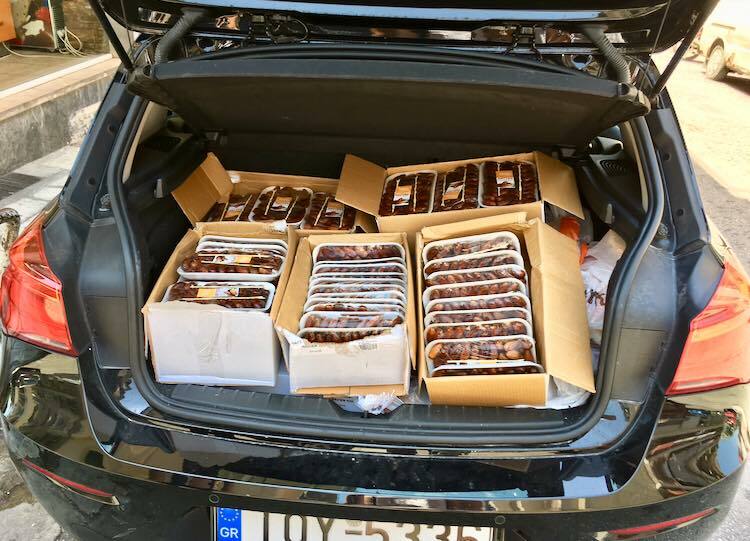 Thanks to a large corporate donation, from Coupa Software, and being their partner charity at a major London Conference, we bought, packed and shipped 1,000 thermal snug packs for our grassroots partners in Bosnia and Herzegovina for immediate distribution to homeless refugees. We helped grassroots training centre, the ANKAA Project, install and equip a working space to train up to 20 refugees per month in barista, bar-tending, customer service, stock control and front-of-house management to get them work-ready in the Greek hospitality industry. We funded six months’ office space for volunteer lawyers in Chios to hold confidential interviews, with up to 50 refugee clients per month. Clients need help understanding and navigating the complicated processes preparing for a first or second asylum interview. We helped provide thermal snug packs comprising long johns, a t-shirt, gloves, socks, snood and hat, for volunteers Heather and Kelvin to distribute to homeless refugees surviving freezing conditions on the Paris streets. We helped grassroots volunteers in Lesvos save over 1.000€ per month on minivan hire by buying a minivan which they use to transport up to 150 refugees a day from Moria Refugee Camp to their clothes distribution centre. We funded six months rent for volunteers in Lesvos to open a much-needed new clothes distribution warehouse for the people of Moria Camp. As winter approached, this was the only distribution centre where the people could choose clothes for themselves with dignity like in a normal shop. We helped volunteers provide hot meals for refugees in Calais and Dunkirk. We helped cover the cost of emergency medical bills and food costs at House of All, a shelter for families with infants/small children, single parents, elderly, and severely ill people, sheltering 75 - 100 people at any one time. We helped volunteer lawyers in Lesvos continue their vital services protecting legal rights and fighting injustices for refugee and asylum seekers by helping with running costs like printing, refugee travel and court fees. We funded flip-flops, t-shirts, sleeping bags and more for young Syrian-Kurdish men and boys. Left with nowhere else to go they were homeless and sleeping in a park when Rando met them and had to help. We funded six urgently needed washing machines for a new women and children-only shower facility near Moria Camp in Lesvos. The women are able to do their washing whilst they shower and in the evening the towels are washed ready for the next day. We funded dates for Ramadan. We funded three month’s rent of a clothes distribution warehouse opposite Moria Refugee Camp where volunteers served hundreds of people every day, distributing donated clothes and toiletries fairly and introducing as much choice as was feesible. We paid for the rent at the House of Humanity in Lesvos. Here they distributed food, clothes and shoes to refugees brought over by mini bus from Moria Camp. The centre offered a calm escape from camp life as well as much-needed aid. We funded firewood for the people of Vial Refugee Camp.